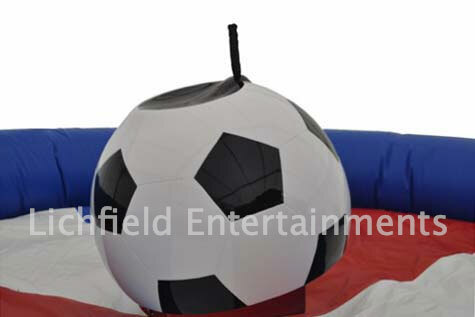 The Rodeo Football Ride is the most recent addition to our range of football themed entertainments. It uses the same motion unit as regular rodeo ride so you get exactly the same spins and tilts only the rider sits on a giant football. The football ride is always supplied with a trained operator who will run the ride safely on your behalf. Unstaffed hire is not available. A mains electric supply will be required although we can supply a generator at additional cost if this is not available. If you have any queries, questions, or would like to hire the Rodeo Football Ride for your event please click here to enquire and we will do all we can to help.